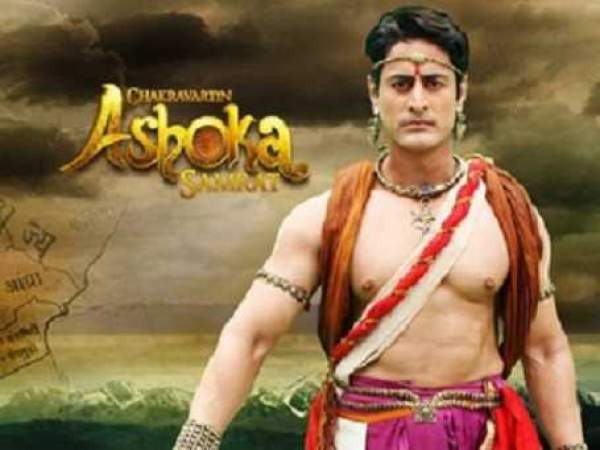 He refuses as he says if he did so then Gondna would kill him, but Ashoka doesnot leaves him. He continuously hurts him to remind that Gondna put them through. On the other side, Kaurvaki gets up and calls Ashoka’s name. Ashoka is beside her. Ashoka informs her that he had her raksha kavach, he placed it on her waist. On the other side, Saimak tells Helen about what had happened. Helen doesnot beleive him. Saimak asks her to see the fear on his face instead of happiness of Ashoka’s death. Helen thinks that Indian were too much emotional, and they harm themselves by staying with the truth. Saimak says that they could rule together if both the brothers left. Sushim hears all this and claps and says that he was lucky to see Gondna. He also appreciates Helen on her being alive when everyone thinks that she had dead. Helen tells him that they were talking about princess Chanda. Saimak and Helen both signal each other. Sushim asks for his share. Helen stops to say anything to Saimak and agrees to give his share. Sushim says that Ashoka was dead as he fallen from a deep height. But he also thinks that he couldnot die so quickly. Bindu asks everyone to pray that Ashoka was alive. Dharma asks her to keep calm. She says that nothing had happened to Ashoka. Bindu is tense also for Kaurvaki. Sushim is nervous as he thinks if Ashoka came, his plan would fail. Nirankush comes to meet Bindu. But Bindu does not want to meet him as he has commited a crime in Pataliputra. Nirankush says that he was at the temple. Bindu replies that all the decision would be taken when Ashoka would come. All of the sudden, Ashoka touches Dharma’s feet. She hugs both of them and feels relax as they both are safe.